Sometimes there is a need to process files in a folder, but first you need to determine which files need to be processed compared to older files that have already been processed. There are several ways that this can be done, but in this tip I show you a way this can be done using SQL Server and XML. Elaborating the problem in depth, let's say I have three text files (or any type of file) in the Source folder and the Destination folder contains two files. The problem is to identify differences between the files in the Source and Destination folders and copy all the modified or new files from the Source Folder to the folder NewFiles. Looking at the images above, it is clear that Source Folder contains one extra file ‘text3' and one modified file ‘text2'. I want to compare the files in these two folders and copy the modified file (text2) and the new file (text3) into folder NewFiles. My first task was to get all the files from the specified folder. This can be achieved via the ‘DIR' command of DOS. DOS commands can be executed in SQL Server through xp_cmdshell system stored procedure, but it needs to be configured first. The below code creates a new stored procedure called "MakeXML" which will create a XML document of all of the files in a folder. The code does a few things which you can either turn on or off as desired. -- To update the currently configured value for advanced options. -- To update the currently configured value for this feature. 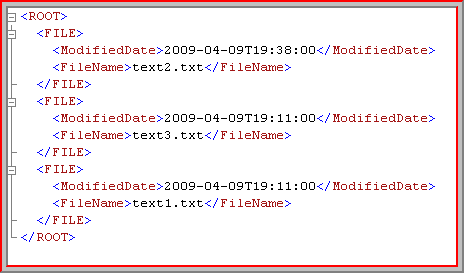 For our example the stored procedure would return XML for the Source folder ordered on modified date as shown below. For our example the stored procedure would return XML for the Destination folder ordered on modified date as shown below. Now, the next task is to compare the two XML documents from Source and Destination, this is achieved by the following stored procedure. The CompareXML stored procedure above will first call the ‘MakeXML' sp and get the source and destination xml. It will fetch all the values from the nodes of both the XML documents and make two types of comparison on those. First the comparison would be on the basis of filename having different modified date values. The second comparison will fetch all the files from Source folder that do not exist in Destination folder. The output of this is put into a Cursor so that such files are then copied to the ‘NewFiles' folder one by one using the DOS xcopy command. Based on our example the "NewFiles" folder will now look like this. The NewFiles folder has the same set of files which had a different modified date and the file which was extra in the Source folder. Now, just copy the files from this NewFiles folder to Destination folder. The problem of comparing files based on modified date and filename has been drastically reduced compared to doing it manually. The extra or the modified files from ‘Source' folder can be copied directly to the ‘Destination' folder rather than copying them to the ‘NewFiles' folder. In your example , as shown in your pics, the MakeXML stored procedure would return two XML files for the Source and Destination folder . Are those two files stored on a Temp Table or on a drive? What changes do I need to make to the code so that I would be able to store those files in a directory on my drive. I like to do that so I can compare the attributes of those two files against another XML file that I created/exported after running a SQL query. Configuration option 'xp_cmdshell' changed from 1 to 1. Run the RECONFIGURE statement to install. The conversion of a char data type to a datetime data type resulted in an out-of-range datetime value. I think that the filepath (C:\Source) which you have specified does not exist. Please read the whole article.. you need to have some files in the source filepath and destination filepath for comparing.. as i have not checked any exceptions in the article.. whenever no files are present in the filepath it will return one row as "File not found". So, please make sure you have kept some files in the source and destination filepath.. otherwise modify the code to return a msg to the user as "No files found"
Thanks Tom. I have used xml as i found it the best to compare tables with less efforts. It can be done without using XML. And regarding using xcopy in bulk is possible too. I have similar code that is currently in production. Necessity is the mother, etc. I was wondering why you chose to use XML. I didn't do the following because the application I wrote must process and modify the file data before moving them, but had you thought of using xcopy in bulk? Thanks for a nice article. The error you might be getting because of the different way in the output of DIR command. The above script would return the list of files got by executing the DIR command and after that i am separating the modified date and filename from a single row returned. The conversion problem is in the same. So, please mail me () or post the output of the above script, so that i can handle the error. Conversion failed when converting datetime from character string.